When analyzing flash malware, you can be sure that sooner or later a sample shows up that tries very hard to hide its purpose from anyone who wants to look under the hood. This is one of the things that make them suspicious and interesting to analyze. Today, I will show you a sample which is like an onion - every time you get rid of one layer of protection, you will find another one. In my previous post on the avast! blog, I wrote about flash obfuscation tricks that are used to hide the purpose of ActionScript2 code. This time we will have a look at a sample that is heavily obfuscated but uses ActionScript3. If you aren't familiar with the structure of a flash file, I highly recommend you to read my previous blog post for a quick format overview. With ActionScript3, the situation is completely different than with AS2 and also it's a bit more complicated. 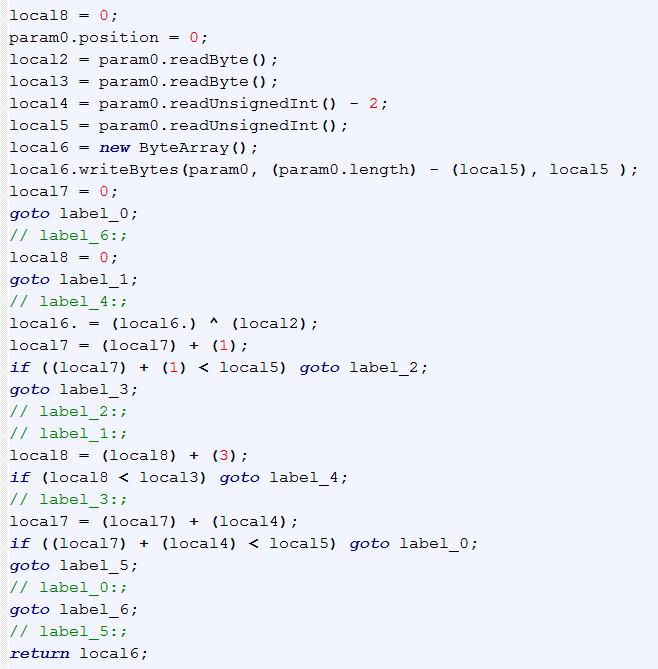 The code and all the metadata (like constants, classes, etc.) is stored in tags called "DoABC". These tags have a structure very similar to java class files: there is a constant pool, method list, their code and so on. The format of the DoABC tags is quite precise so you cannot hide things so easily as you can in the case of DoAction tags (used in ActionScript2). But, that does not mean it isn't possible. There are many obfuscation techniques that can be used to defeat the vast number of disassemblers out there and in this article we will look at some of them. The error above tells us that the instruction "newobject" causes stack underflow (so it tries to get something from the stack, but there is not enough data on it). In the code above, we see the instruction in question. It has a parameter value 0xB2EB9 which looks strange. Looking into the manual, we learn that the parameter specifies the number of properties the newly created object should have and that these properties are read from the stack. It is now clear that this instruction is a trap and won't ever execute correctly. But why does that flash file work fine? That's because the flash player will never get to this instruction! There is a jump instruction right before the bad one which makes the flash player skip the bad instruction and resume execution right after it. Looking at the code of all methods, we see tons of such traps, so we need to remove them. 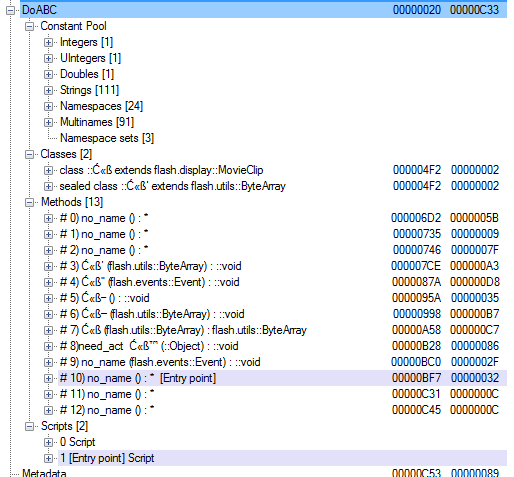 By simply "nop-ing" the relevant parts of the byte code, we remove them and now the disassembly works great! One layer of protection is removed, but we still have no idea what the sample does. There are still quite a few methods doing something with a byte array though. 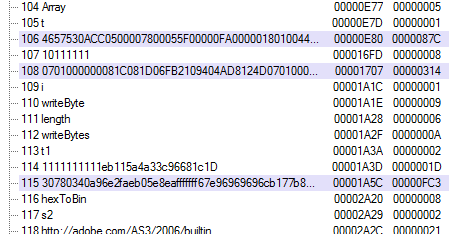 At some point, the byte array is loaded and executed as a flash file - this is a strong indication of something fishy going on. But where does this byte array come from? In order to see what is stored in the tag we first need to decrypt it. Of course the DoABC code needs to do that too. Since we already have unscrambled the DoABC code, it's just a matter of seconds to find the decryption method. Aha, here it is! I am sure most of you recognized the above data: it is compressed with zlib. After decompressing it, I expect to see a flash file, but I get a surprise instead. Instead of one flash file, I get yet another special byte array. This time, its purpose is clear. 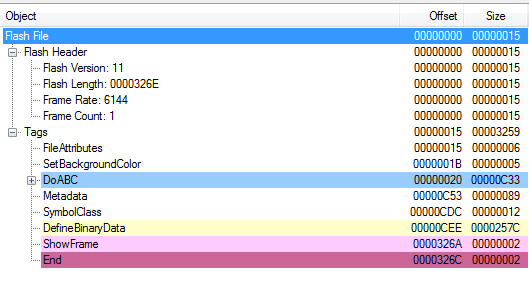 Apart from some metadata, three working flash files are embedded in it! The first highlighted string is a well-known exploit trigger and the last one is the actual shellcode that runs when the exploit is triggered. Of course it's not quite that simple, both of these strings are broken into parts and need to be first chained together and converted into a byte array, but you get the point. Avast detects this malicious flash file as SWF:Dropper and the payload as SWF:Agent-L so you have nothing to worry about. But this case shows that flash obfuscators are getting popular on the malware scene and we need to be prepared for that. As you have just seen, hiding something in flash under several layers of encryption is really not that hard.